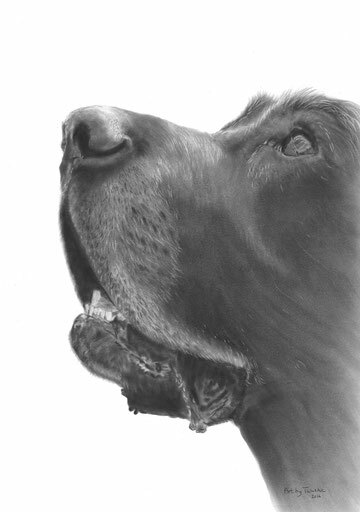 A dog drawing is a special and deeply personal gift that makes a lasting memory of your beloved four legged companion. Please add 50% for the price of a double dog drawing (only availably in A3 and A2 size). To secure your spot on the waiting list, you need to pay a deposit of $50 (unless agreed otherwise). This deposit won't be returned in case you change your mind about the commission. I accept payment via bank transfer and PayPal. Please take into account that payment via PayPal will cost an additional $10, since PayPal charges a fee to use their international transaction services. Shipping a dog drawing within the Netherlands costs $17,-. Dog drawings being sent outside the Netherlands will be sent via courier and will be individually quoted (starting at $30). The drawings are always shipped with insurance and securely wrapped. Art by Talitha is not liable for any damage during shipment. Sending a framed drawing is very costly and the likelihood of damages occurring to the valuable drawing and/or the frame is very high. Because of these reasons, I send the dog drawing without frames. Frames are available in all art & craft stores, as well as photography stores. In most places the staff will be very helpful and will support you with the framing of your drawing. Please make sure you read the Art by Talitha 'Terms and Conditions' that can be found here. I'm only satisfied if you are! I pride myself on my customer satisfaction and will only take full payment when you are 100% happy with my work.